With Super Bowl LIII firmly in the rearview mirror, it's time to switch gears to baseball season. My offseason was relatively withdrawal free. I've played a more active role with the Chicago's Society for American Baseball Research (SABR) chapter by planning get-together lunches, designing monthly newsletters and helping secure speakers for SABR Day. Last year, I managed to attend 23 games. I know I'm a regular at MLB games, and having access to two teams locally and Milwaukee being only 90 minutes north, I have the luxury of seeing all 30 teams in person on a regular basis. That said, a few years ago I started tracking which teams I see and when. This list includes all regular season and postseason games. Spring training and All-Star Games do not count. When I saw the results, it prompted me to think: hey, better see the Tampa Bay Rays or how long since I've seen the New York Yankees? What trends have emerged? During 2018, I saw 17 of the 30 teams (57%) play at least once. Let's pull back a little. 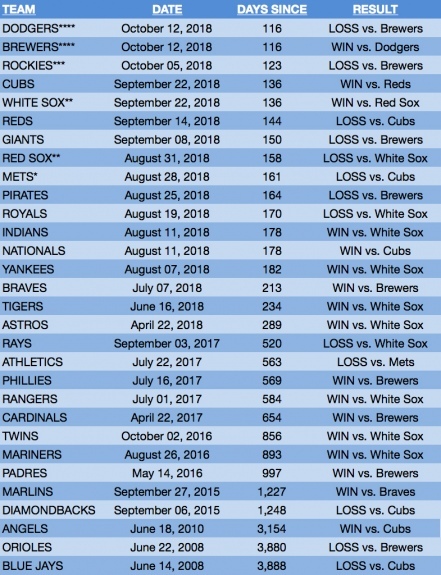 Since the start of 2015, I've seen all but three teams. But for some reason, there's a significant gap. Somehow the Los Angeles Angels, Baltimore Orioles and Toronto Blue Jays have played hard to get. In fact, a full decade has passed since I've seen the Orioles and Blue Jays. With further ado, here's the list.